The Oconee County Planning Commission voted tonight to accept the request of Presbyterian Homes of Georgia for a postponement of consideration of its request for a rezone of 96 acres on Rocky Branch Road for a continuing care retirement community. 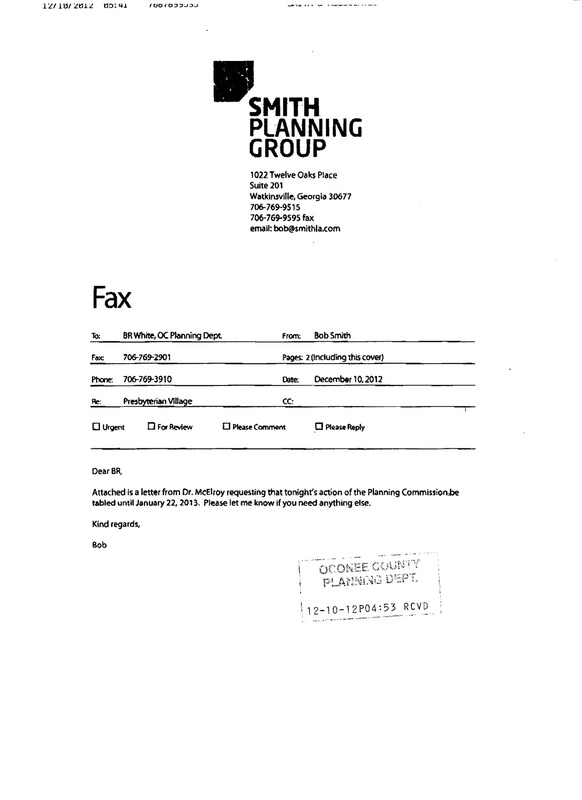 Smith Planning Group, 1022 Twelve Oaks Place, just east of Butler’s Crossing, sent a fax to the Oconee County Planning Department seven minutes before official closing time today asking for the delay on behalf of his client Frank McElroy, president and CEO of PHG. 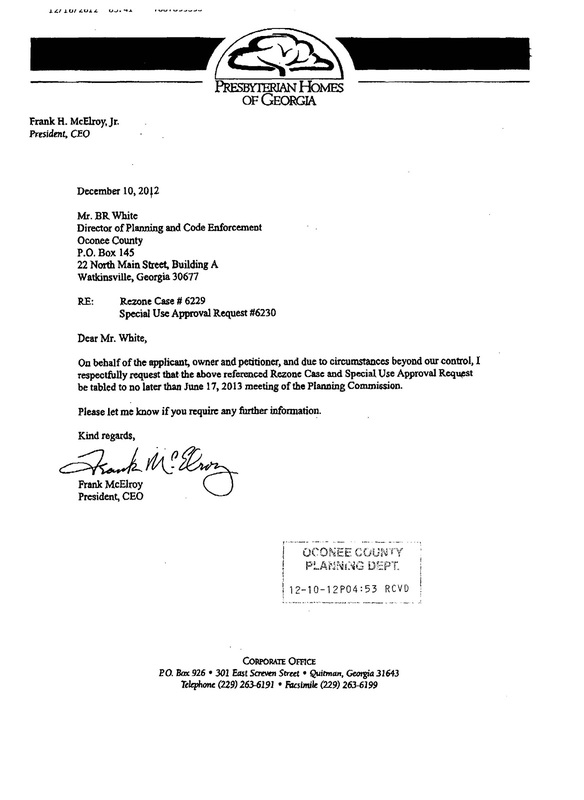 Though McElroy and Bob Smith from Smith Planning were present, they were not asked to speak on behalf of their request. In the video below, they await the opening of the meeting. The Planning Commission voted, with only member Dan Webber opposing, to grant the delay. Arnold thanked the citizens for turning out for the meeting and invited them to come back in June. PHG informed Oconee County officials in early August that it was reviving its plans for its Presbyterian Village project in Oconee County, but not at the original site on Bishop Farms Parkway near Butler’s Crossing. Instead, PHG said it planned to use the undeveloped Autumn Glen subdivision across from Old Waverly subdivision and just west of the Rowan Oak residential complex for the continuing care retirement facility. PHG is asking the county to change the existing zoning for the Autumn Glen property from R-1 Single-Family Residential District to R-3 Multi-Family Residential District. Because the R-3 category allows for a continuing care retirement community only as a special use, PHG also is asking for special use approval. PHG has no formal connection to the Presbyterian Church. The Oconee County planning staff recommended against the rezone and special use on the ground it “appears to conflict with the development goals and strategies” the county has established for the area. Those who came to support or oppose the rezone and special use request tonight filled more than half of the courtroom on the third floor of the courthouse that the Planning Commission uses for its meetings. Opponents, many wearing red, appeared to outnumber supporters by a large amount, though the sign up sheet for the rezone contained the names of 13 individuals, including Smith and McElroy, to speak in favor and six people to speak in opposition. The sign up sheet for the special use contained 14 names in support, including Smith and McElroy, and six in opposition. Most opponents and proponents filed out of the room after the Commission voted to delay action on the PHG requests. The Planning Commission next reviewed a series of proposed changes in the Unified Development Code. Most of the discussion was on new regulations allowing residents in keep chickens on their residential lots–with restrictions. When facing a loss, it is never called a retreat. It is a "tactical delay" or "strategic repositioning." Considering the names and money behind the effort to ram this one down a neighborhood's throat, it was wise to divert attention. Score one for the people.